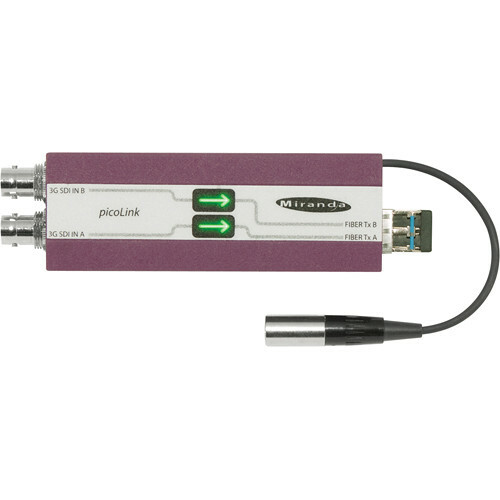 The Miranda Technologies High-Power Dual 3G / HD / SD picoLink Optical CWDM Transmitter, from the FIO-991p series of flexible and serial digital video to / from fiber converters, features an SFP optical plug-in cartridge. This picoLink optical CWDM transmitter is designed for transmitting 3G, HD, and SD serial video, as well as compressed bit-streams (DVB-ASI). This high-power dual channel transmitter generates 2 adjacent CWDM wavelengths compatible with the external CWDM Mux / Demux (sold separately), which can be used to carry different SDI signals on a single fiber strand. This CWDM fiber optical transmitter supports any data rate within the range of 19.4 Mbps to 2.97 Gbps, and provides reclocked serial digital video from 270 Mbps to 2.97 Gbps. This hot-swappable SFP module offers easy maintenance and configuration flexibility. Box Dimensions (LxWxH) 17.0 x 10.0 x 2.0"